Although it is possible to start the vehicle in N, it is safer to start it in P.
When starting the engine in cold weather, turn off all electrical accessories such as the lights, climate control system, and rear defogger in order to reduce battery drain. The immobilizer system protects your vehicle from theft. If an improperly coded device is used, the engine's fuel system is disabled. 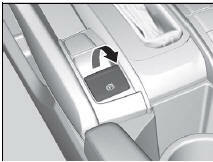 Bring the smart entry remote close to the ENGINE START/STOP button if the battery in the smart entry remote is weak. 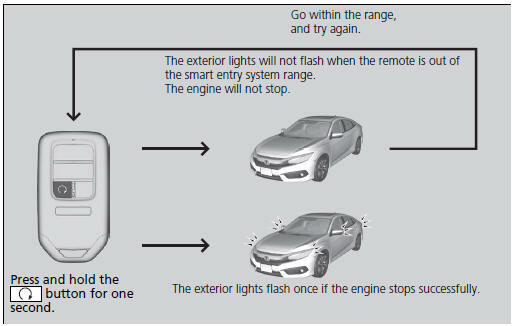 The engine may not start if the smart entry remote is subjected to strong radio waves. Do not hold the ENGINE START/STOP button to start the engine. If the engine does not start, wait at least 30 seconds before trying again. Press the ENGINE START/STOP button without depressing the accelerator pedal. Press the ENGINE START/STOP button. If the shift lever is in N, press the ENGINE START/STOP button. 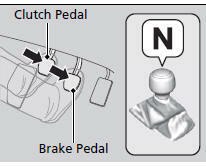 If the shift lever is in any gear other than N, depress the clutch pedal, then press the ENGINE START/STOP button. 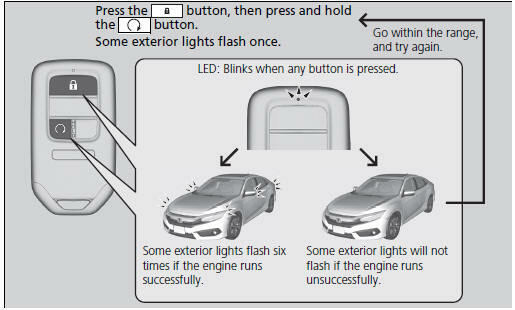 You can remotely start the engine using the button on the smart entry remote. When started remotely, the engine automatically shuts off after 10 minutes of idling and the brake pedal and ENGINE START/STOP button have not been pressed simultaneously. To extend the run time for another 10 minutes during the first run, press the button, then press and hold the button. Some exterior lights flash six times if a 10-minute extension request was transmitted successfully. WARNING Engine exhaust contains toxic carbon monoxide. Breathing carbon monoxide can kill you or cause unconsciousness. Never use the remote engine starter when the vehicle is parked in a garage or other area with limited ventilation. The remote engine start may violate local laws. Before using the remote engine start, check your local laws. If there are buildings and obstacles between your vehicle and the remote, the range will be reduced. The range may be less when the vehicle is running. This distance may vary by external electrical interference. 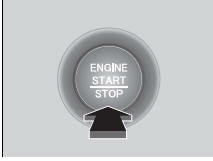 You have disabled a remote engine start setting using the audio/information screen*. The power mode is not in VEHICLE OFF (LOCK). The gear is in a position other than P.
The hood is open, or any door or the trunk is unlocked. You have already used the remote twice to start the engine. Another registered smart entry remote is in the vehicle. There is an antenna failure. Door is unlocked with the built-in key. The engine oil pressure is low. The engine coolant temperature is extremely high. The security system alarm is not set. While the engine is running, the vehicle will automatically activate climate control with a preset temperature of 72F (22C). The air conditioning is activated in recirculation mode. The defroster is activated at a moderately warm temperature. The rear defogger, door mirror heaters, and seat heaters* are activated. 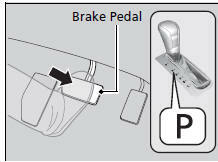 Depress the brake pedal and press the ENGINE START/STOP button simultaneously. Put the shift lever in D. Select R when reversing. With the parking brake is applied, release the brake pedal and gently depress the accelerator pedal. Gradually release the brake pedal and gently depress the accelerator pedal to pull away. The engine stops when the shift lever is moved out of P before the ENGINE START/STOP button is pressed. Follow step 1 when starting to drive. Depress the clutch pedal, and shift to one of the forward gears when facing uphill, or R when facing downhill, then release the brake pedal.